Rice is believed to have come from India to Iran via the Silk Road. Nearly every meal has hot steaming fragrant rice as the centre piece. Rice to Persians has only one meaning; Basmati. A number of varieties of rice is grown in the Caspian region with Tarom Domsiah being the highest grade of Basmati resulting in the most fragrant, fluffiest, flakiest and the lightest cooked rice, even though it is a very low yielding crop however, quality goes before quantity for rice aficionados. Iran has never been able to commercially export this grain and it has never been able to meet demand there. Today, Iran imports rice from India and Pakistan however, the imported grains lack the distinctive flavour and aroma Tarom Domsiah has. 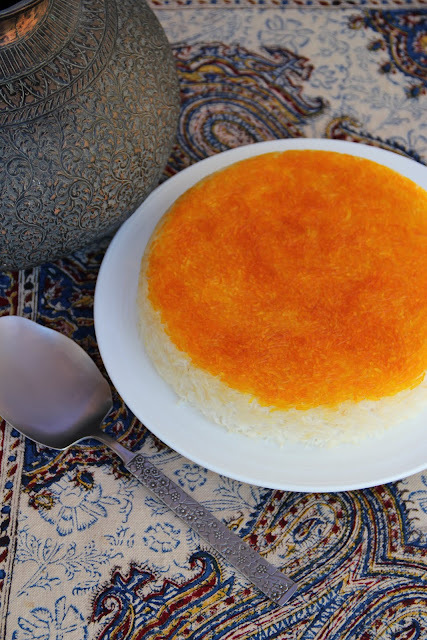 Persian rice is a new revelation for those that have tried sticky Asian rices. There are two methods of cooking rice; one being Dami or Kateh, and the other is the most popular method of boil-drain-steam. 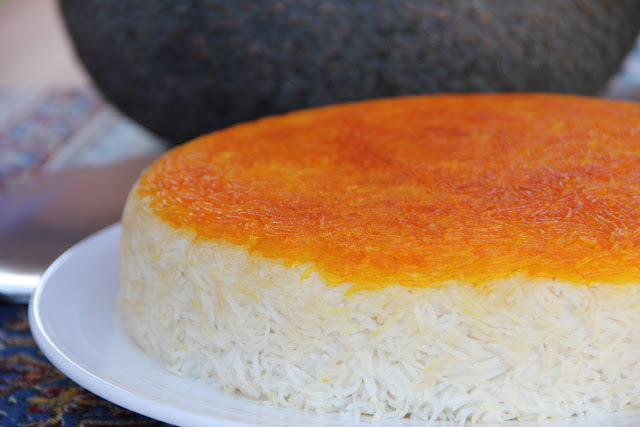 Kateh is the most simplest method which involves adding water, salt and oil to rice and cooking it on low heat until all the water is absorbed. The latter results in a more fluffier and flakier rice which gives the rice connoisseurs the option of choosing from a variety of tah-deegs (crust of the bottom of the pot). The most elegant way to serve rice is to turn it upside down from the pot unto a serving platter to display the golden crunchy tah-deeg for everyone to fight over! A humble home cooked meal usually has a platter of rice spooned from the pot and the tah-deeg cut into pieces and placed over cooked rice. There is a never ending list of stews plain steamed rice is serves with so, mastering the steaming method is a rewarding experience! 1. Wash the rice under running water until water runs clear and drain. 2. Bring water to boil in a heavy-based pot. Add the rice and salt to the boiling water and stir few times until water returns to the boil. Allow rice to boil for 5 minutes or until slightly soft and elongated. 3. Drain rice in a colander (strainer) to remove the starchy water. Pour 1 cup of lukewarm water over the rice. Add 1 tablespoon of saffron to 1/2 cup of parboiled rice and mix well. 4. Heat a non-stick or heavy-base pot. Add enough oil to cover the base. Pour saffron rice into the pot and spread to cover the base. Spoon the remaining rice on top into heaped pile and reduce the heat. 5. Use the end of a wooden spoon and lightly push it few times into the rice, about 2-3 cm deep to make wells to trap steam. Cover the inside of the lid with a tea towel or two layers of paper towel. Put the lid on firmly. 6. In a saucepan, heat 1/4 cup of water and butter or oil until bubbling. Add saffron and pour it over the rice and return the lid immediately. Cook for further 30 minutes on low heat. 7. Remove the lid, put a serving platter on the top of the pot and turn the pot upside down to remove the rice completely into the platter or spoon the rice out carefully not to disturb the tah-deeg, then break the tah-deeg and arrange it around the rice or in a separate plate. It is best to practice this method of rice cooking a few time, as the amount of water and boiling time depends heavily on how long the rice has been aged after harvesting and on the variety of rice. If you don't have a non-stick pot, use a heavy-base one. Once the rice is cooked, place the pot half way into a cold water for few seconds. Every region has it's own preferred method of cooking this simple grain such as; soaking the rice in water for a few hours before boiling. In fact, it significantly reduces boiling time. Cool! It looks so attractive for me.